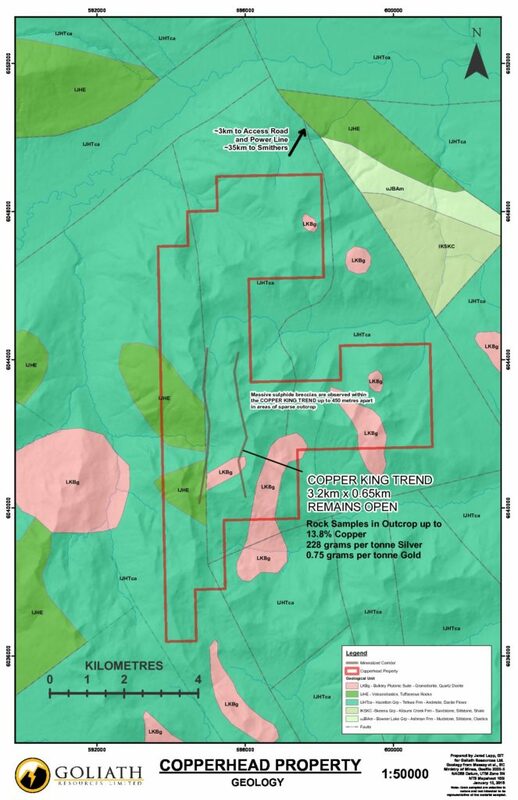 The Copperhead property covers 4,354 hectares and 6 kilometres to the nearest road and power-line. 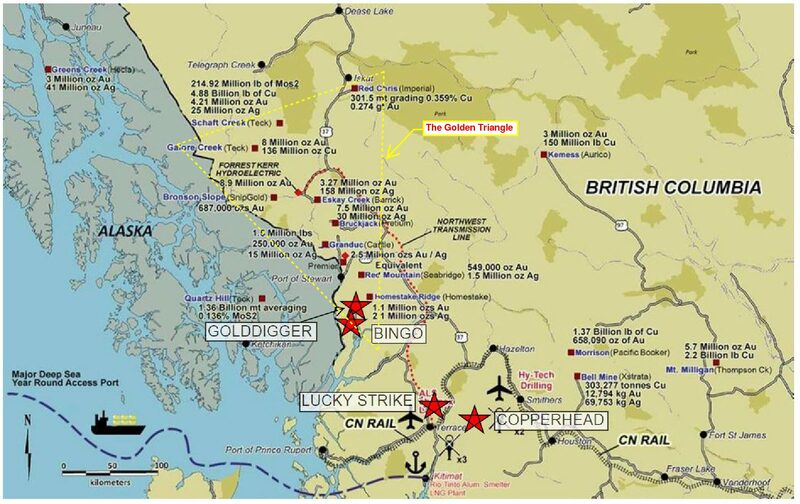 It is located 35 kilometres southwest of from Smithers BC and situated south of the Golden Triangle area. 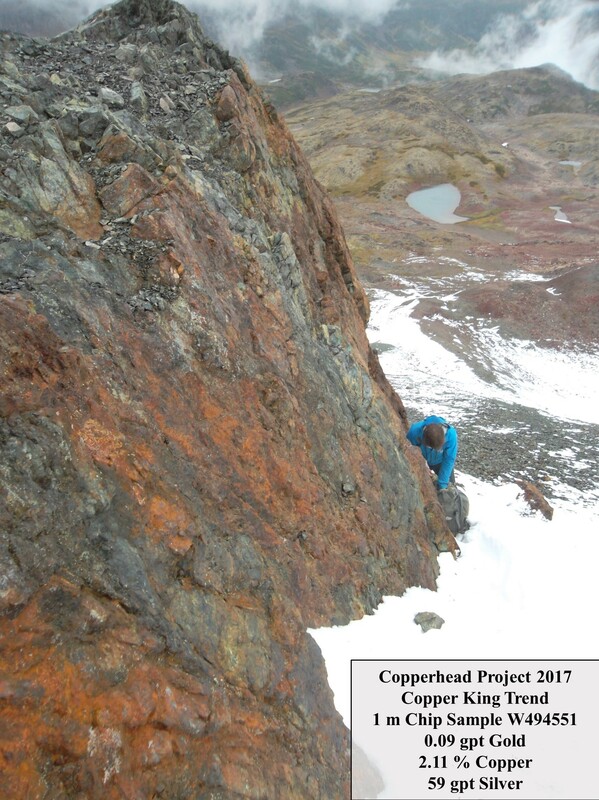 It resides within the Skeena Arch; a belt-scale structural corridor associated with significant porphyry and related mineralization. 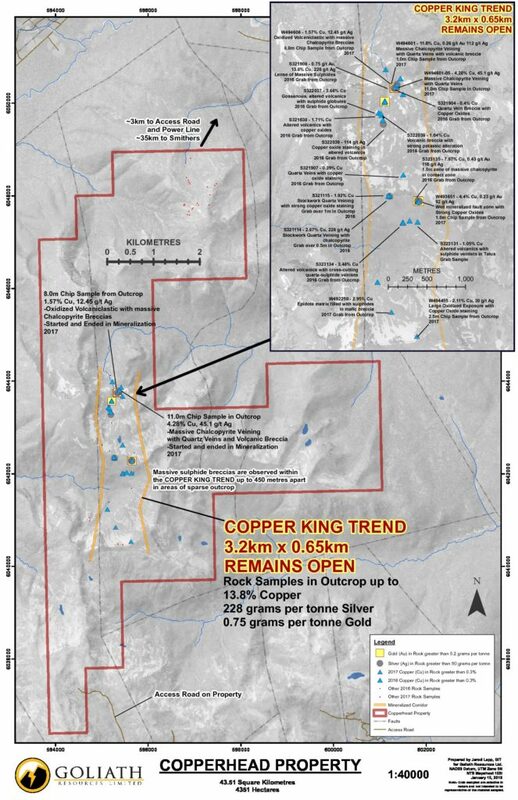 The newly discovered and sampled Copper King Trend measures 2 kilometres long x 350 metres wide and remains open. 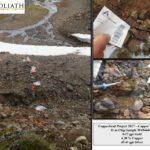 This discovery was made where bedrock has been exposed due to recent glacial abatement. 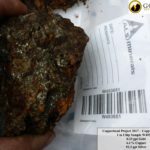 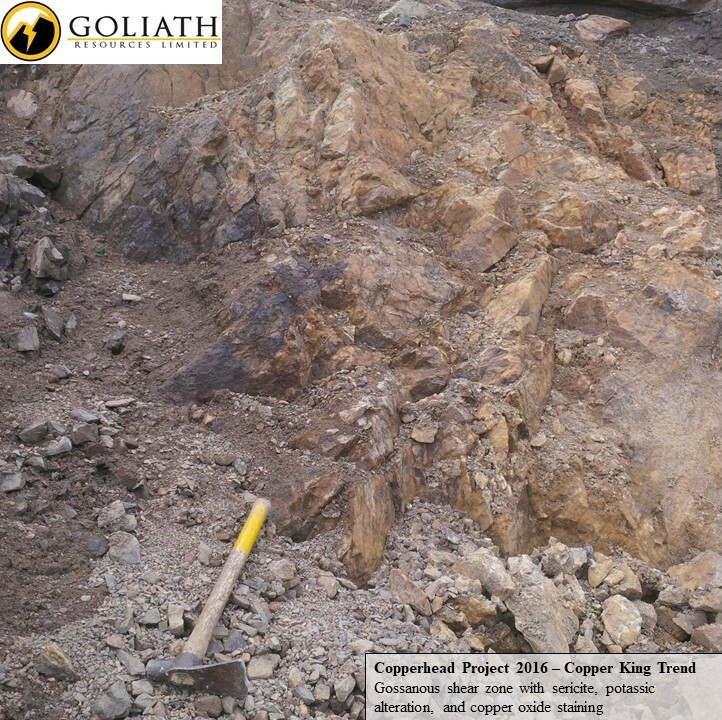 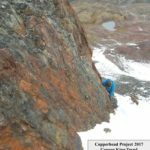 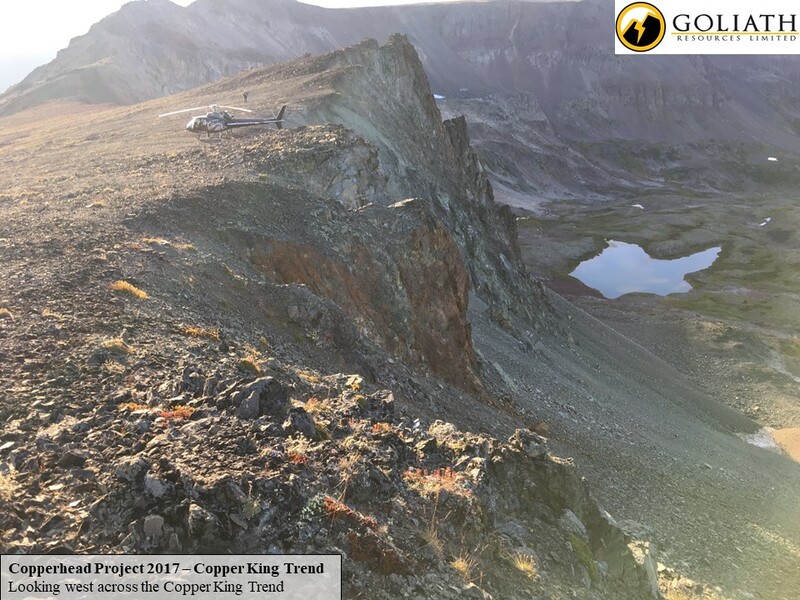 In the northern region of the Copper King Trend, 2016 bedrock samples from a 15 cm wide massive chalcopyrite-pyrite vein returned bedrock assays up to 13.8 percent copper, 228 grams per tonne silver (8 ounces per ton) and 0.75 grams per tonne gold. 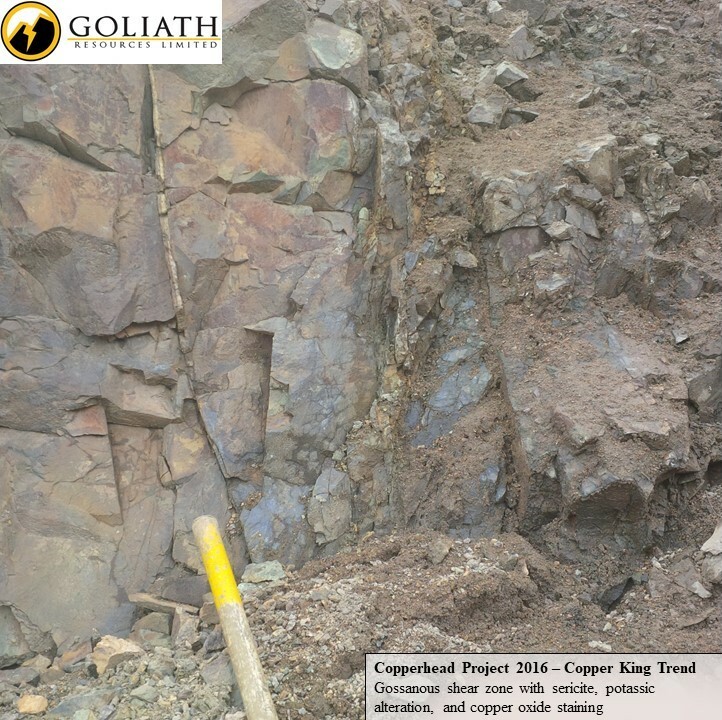 Adjacent massive chalcopyrite-pyrite replaces the tuffaceous matrix in flat laying coarse grained volcanoclastic horizon from which assays have returned up to 4.6 percent copper and 80 grams per tonne silver. 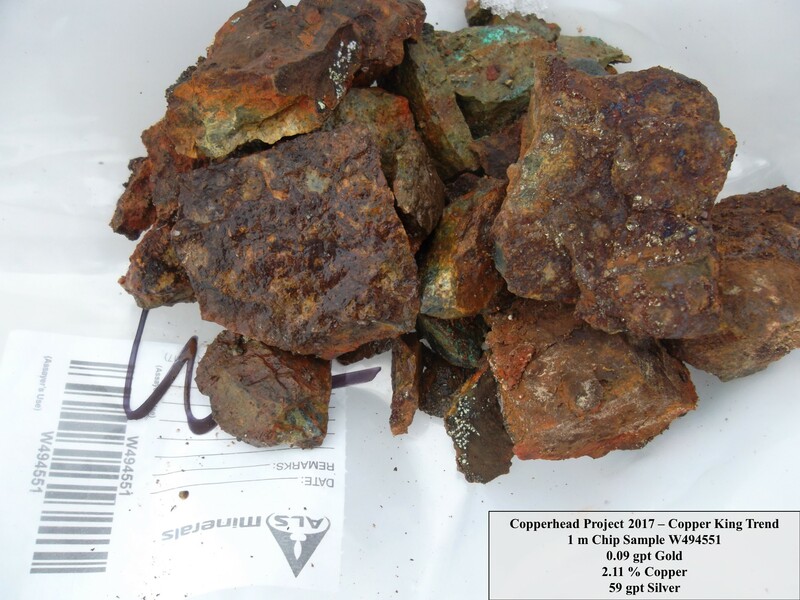 80 percent of the samples assayed over 0.1 percent copper, and 48 percent returned over 1.0 percent copper. 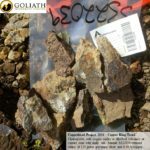 In 2017 an 11 metre chip sample taken from a volcanic breccia containing massive and semi-massive sulphides returned 0.17 g/t Au, 4.28 % Cu, and 45.41 g/t Ag. 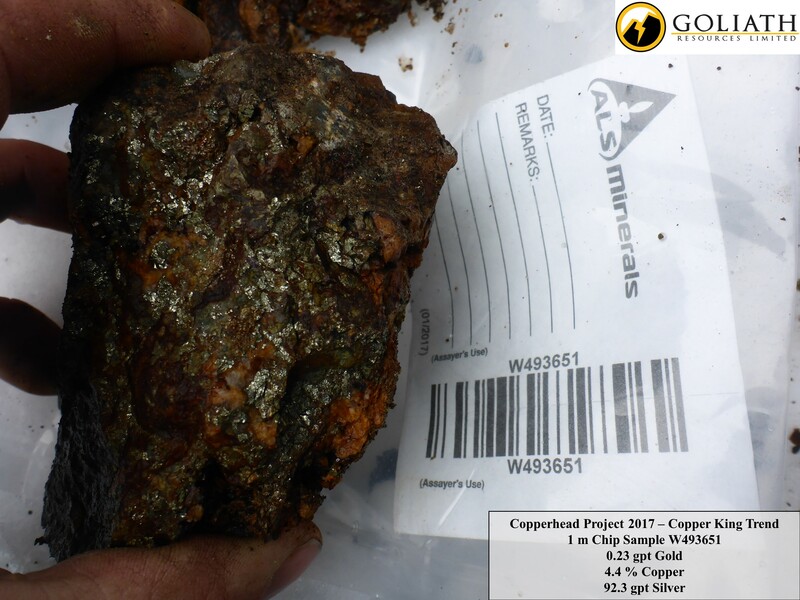 The chip sample started and ended in mineralization that remains open. 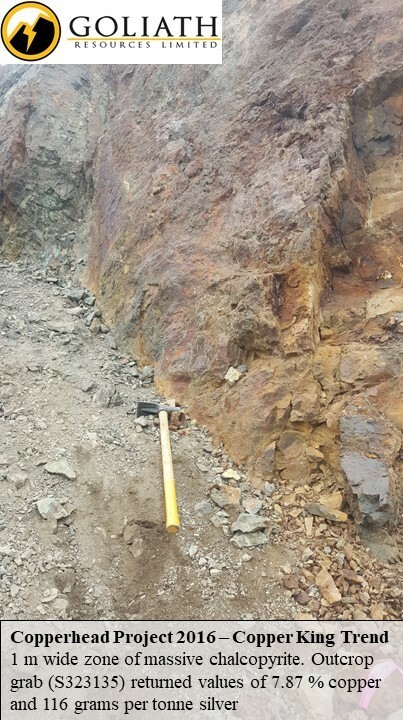 The orientation of the breccia zone is not known and thus the true thickness of the mineralized zone remains to be determined. 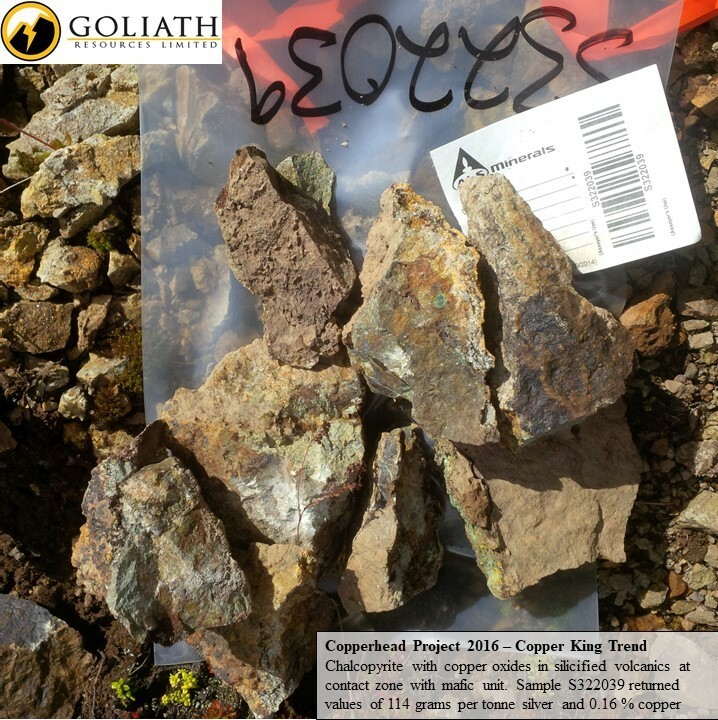 As well an 8 metre chip sample returned 0.08 g/t Au, 1.57 % Cu, and 12.45 g/t Ag. 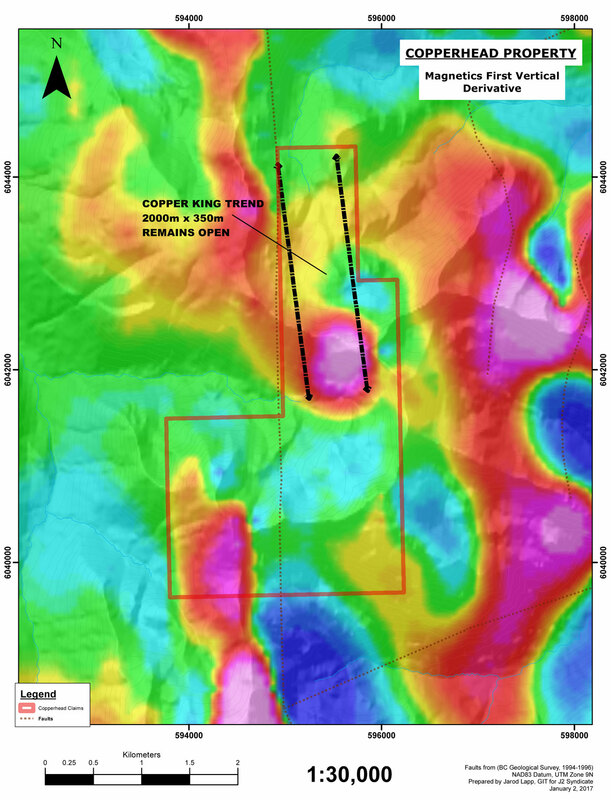 True thickness of the mineralized zone remains to be determined. 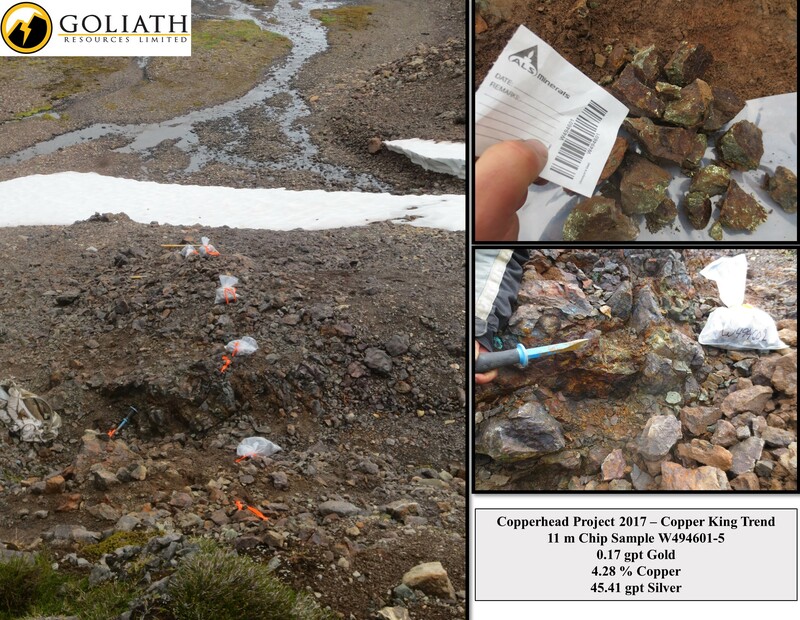 Both chip samples started and ended in mineralization that remains open. 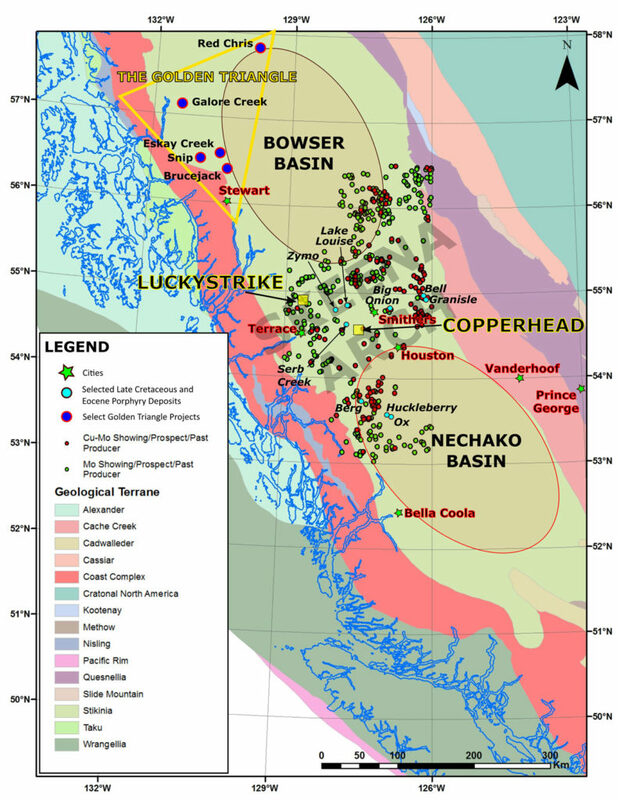 The Copper King Trend runs parallel to a major regional fault zone and along the structure are three separate granitic intrusions. 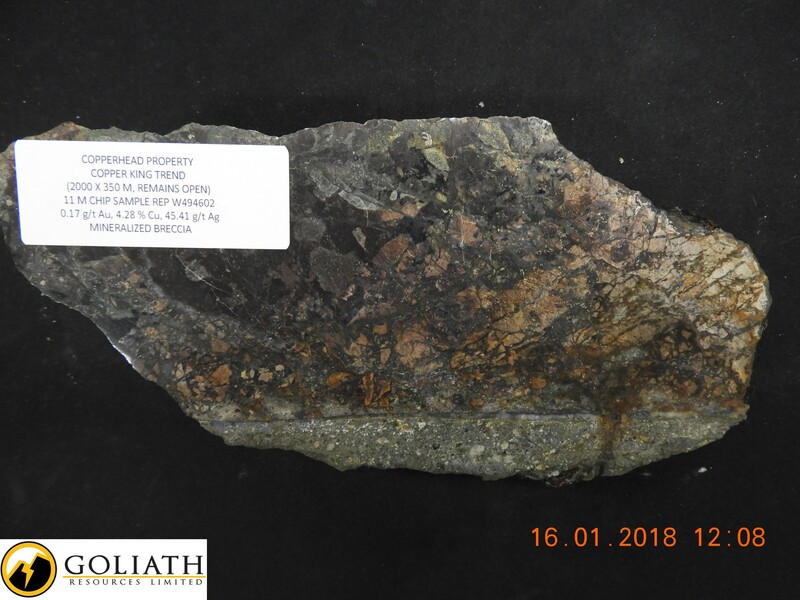 The intrusive units range from a very oxidized altered granodiorite with associated quartz-sericite-pyrite alteration halo to a quartz diorite with potassic alteration. 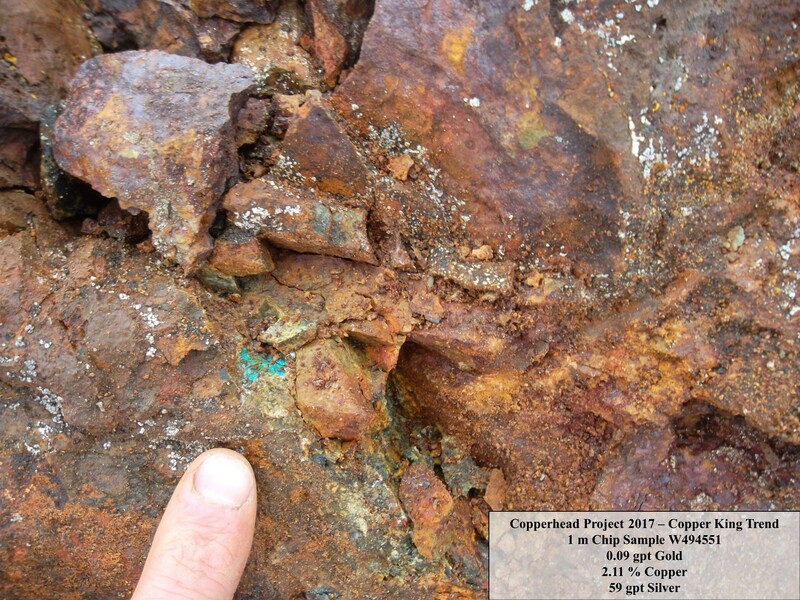 Mineralization occurs as massive chalcopyrite-bornite-pyrite in veins and as matrix replacement in volcaniclastic horizons. 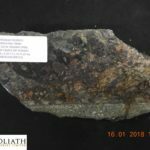 Chalcopyrite with lesser pyrite and bornite was discovered in quartz veins along or proximal to faults or within potassic and quartz-sericite-pyrite alteration zones. 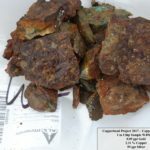 Veins are likely high grade feeders to more extensive stratiform replacement mineralization. 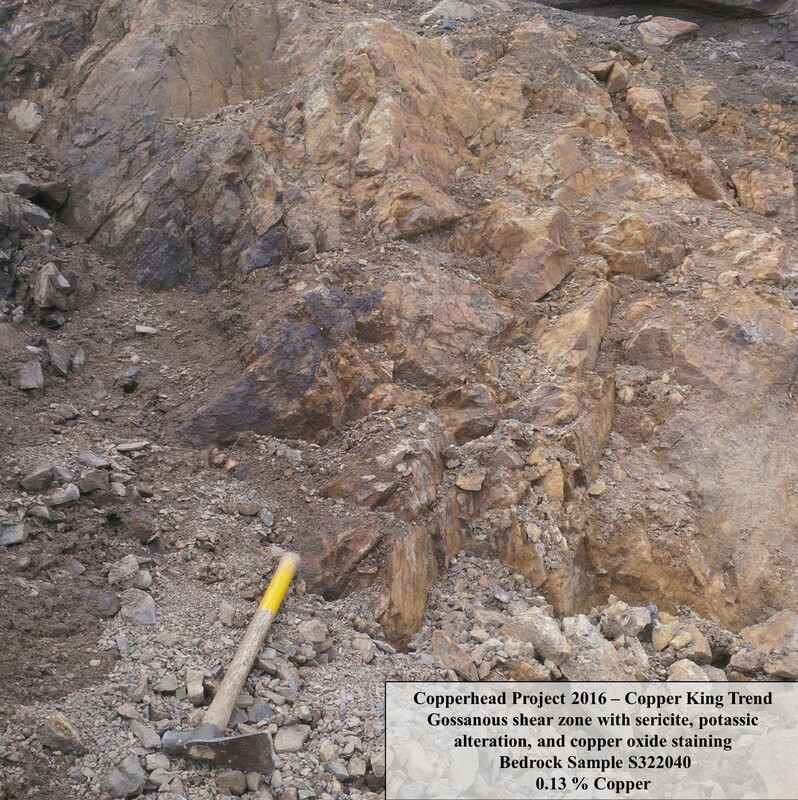 Towards the central region of the Copper King Trend extensive potassic alteration and silicification occurs in volcaniclastic rocks. 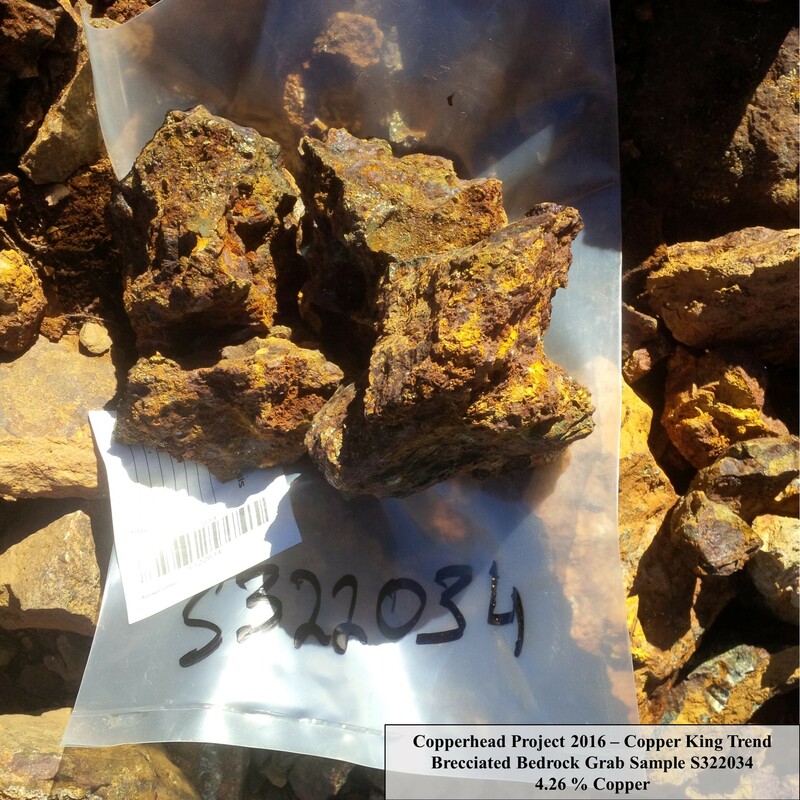 Throughout the altered zone chalcopyrite forms globules, fills fractures and forms veins with bornite. 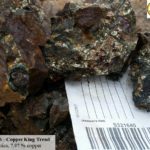 2016 assays from the zone have returned up to 7.97 percent copper, 165 parts per billion Au and 28.3 grams per tonne silver and the zone remains open. 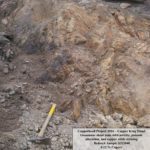 Intense potassic alteration and silicification is most likely related to an intrusion at depth; large granitic stocks occur along trend to the north and south. 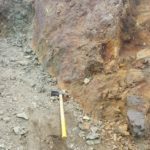 To the south, granodiorite is strongly oxidized and has a peripheral quartz-sericitepyrite alteration zone. 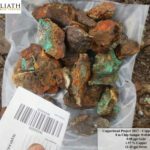 The extensive gossan displays intense jarosite staining with minor malachite and locally contains chalcopyrite-pyrite-quartz stockworks which have yielded bedrock values up to 2.87 percent copper and 139 grams per tonne silver over 0.5 meter. 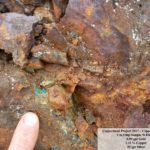 Normal faulting is common through the property; mineralized faults are strongly oxidized and limonitic with malachite along fractures forming zones up to 2m wide. 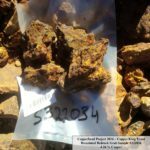 in 2016, a one meter chip sample across a faulted contact with remnant massive chalcopyrite-pyrite in a limonitic breccia towards the south end of the Copper King Trend returned 7.87 percent copper, 116 grams per tonne silver and 336 parts per billion gold. 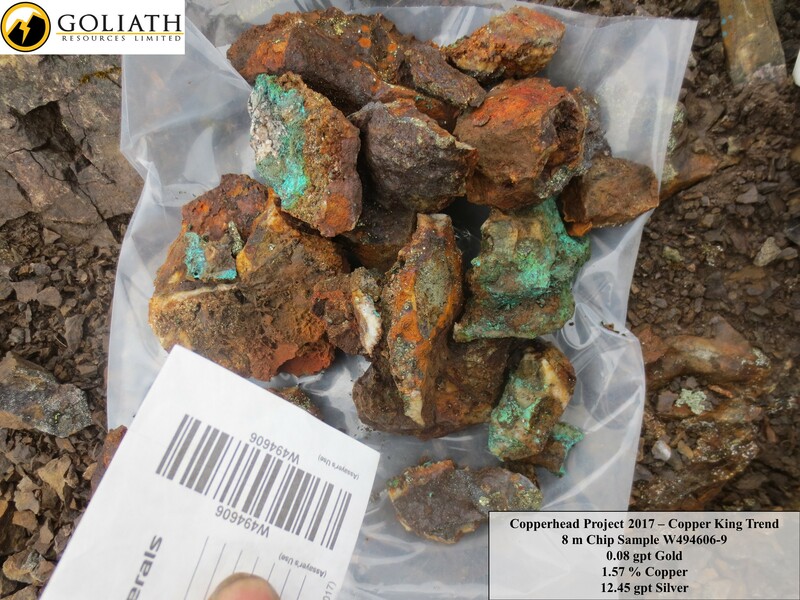 Within mafic lithologies quartz-chalcopyrite-galena-pyrite veins have been observed near contacts and in shears with epidotized wallrock and malachite staining, assays have returned up to 3.48 percent copper and 114 grams per tonne silver. 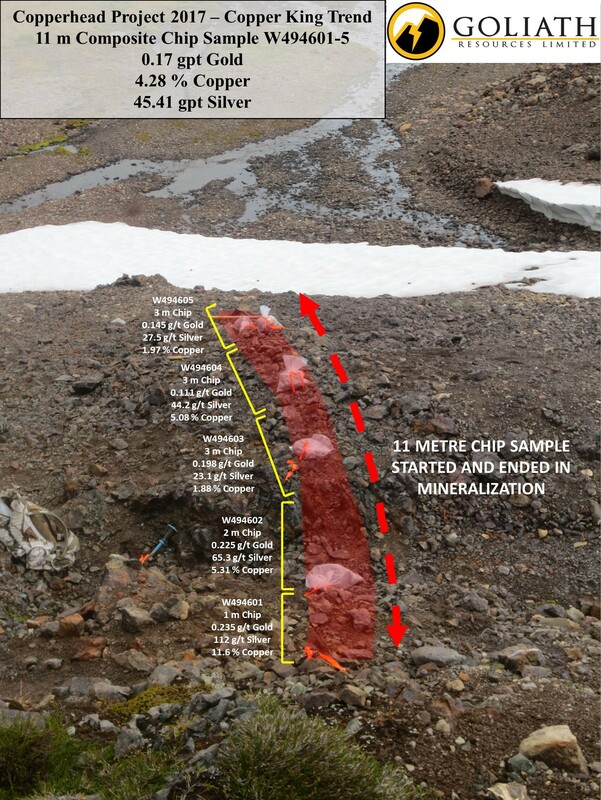 Mineralizing fluids more than likely originated from intrusive activity localized along the prominent regional structure. 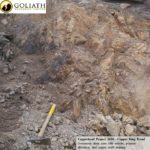 Within the regional fault zone are paralleling and echelon structures; this offers a zone of weakness and dilation for the intruding granitic units and provides transport for migrating mineralizing fluids. 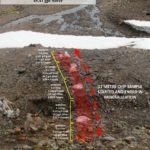 Mineralizing fluids generated through the repeated intrusive activity vary in composition and chemistry with the degree of wall-rock interaction and proximity to a migrating intrusion. 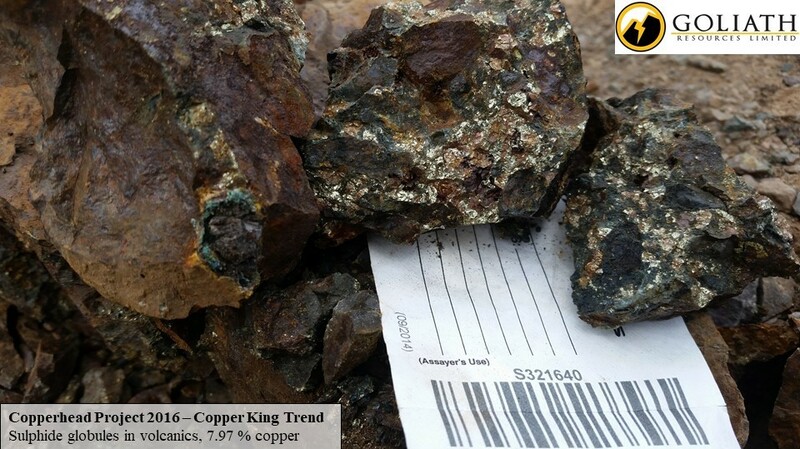 Geochemically, a majority of samples display elevated As, Bi, Co,Mn, Mo, Pb, Sb and Zn signatures. 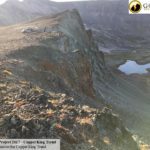 The gently dipping succession of mafic to felsic volcanic rocks are interbedded with porous and permeable tuffaceous ignimbrites and volcaniclastic units that offer suitable sites for wide spread replacement mineralization. 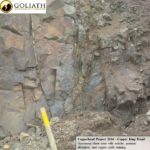 © 2017 Goliath Resources Ltd. All Rights Reserved.